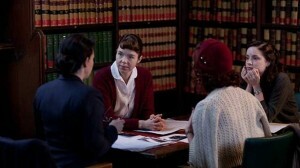 Last spring, the three-part miniseries The Bletchley Circle aired on PBS. Set in England in 1951, the show’s first season imagined what it might have been like for four female former code breakers to return to their daily routines after World War II. The show made me think about the role of women during and after the war, but also about communication, transparency and loyalty in modern society, which was the topic of one of my posts for the New York Women in Communications blog Aloud. This season, “The Bletchley Circle” explores false imprisonment, blacklisting and human trafficking while the era of the Cold War is taking hold. By the second episode, the women successfully find evidence to exonerate fellow codebreaker Alice Merren, (played by Hattie Morahan) who has been framed and charged with murder. Millie escapes her captors by agreeing to work for their leader Marta (played by Brana Bajic), yet she is haunted by the trafficked women she left behind. Determined to stop Marta, the “Circle” women mount a sting operation. Lucy (played by Sophie Rundle) does some intelligence work behind the scenes at Scotland Yard, where she now works. She learns that a high ranking police officer is no doubt helping Marta and her gang evade prosecution. Julie Graham’s character Jean dons fur and red lipstick to impersonate a mob boss, and using Millie’s “blood money,” they make a deal with Marta for a bulk order of contraband cigarettes and perfume. Lucy’s photographic memory serves her well when she catches a glimpse of Marta’s ledger entries and later reproduces them on paper. The women determine the entries are coded and work at deciphering them. During a visit to Bletchley Park, which has been turned into a training center, they crack Marta’s code with the help of a “borrowed” German Enigma machine. This leads to the confiscation of contraband cigarettes and perfume; to the rescue of young Czech women who otherwise would have fallen victim to a human trafficking ring; and to the arrest of Marta and her cronies. While the show’s events sometimes require suspension of disbelief, the series deserves attention for the way it continues to highlight an interesting time in history from a feminine perspective. It’s fascinating to watch the skilled analysis and intelligent, deductive reasoning of women at a time when women’s intellectual contributions were devalued.